In today’s world, it is not enough to be a scientist doing good science. Scientists must also be (or become) effective communicators of the science they do. The public needs to understand what we do, why we are doing it, and what we are learning. There is inherent value in the work we do and it is relevant to the public at large, not just to scientists. An educated and engaged public is the only way to change the status quo. My involvement in the 2010 Deepwater Horizon event has led me to become an outspoken advocate for the oceans and for environmental literacy." In the words of ECOGIG program director Dr. Mandy Joye, the Deepwater Horizon incident was professionally and personally life changing. Today we continue our 3 part series in honor of the 5th anniversary of the April 2010 Deepwater Horizon oil spill. 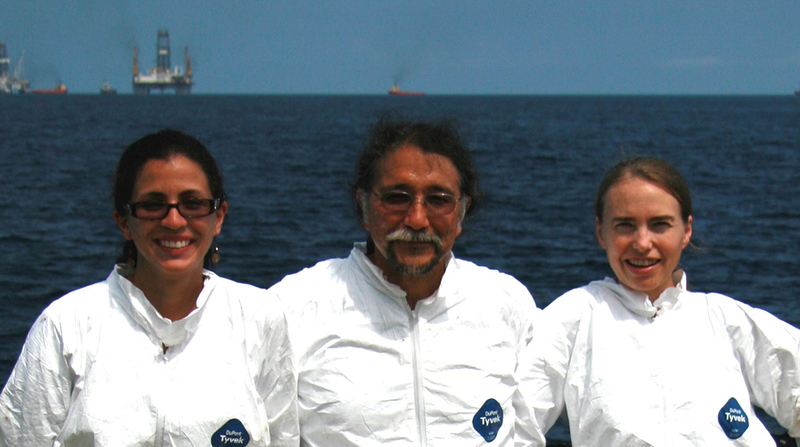 In anticipation of this important anniversary, we asked the ECOGIG investigators for their perspectives on their work since the Deepwater Horizon oil spill. Part 2 has been split into 2 sections, each highlighting a group of ECOGIG scientists. What are your most significant contributions to advancing DWH science? During the response phase of the DWH incident, my group played a key role in describing the deepwater plume and its impacts. We found that the plume was enriched in hydrocarbon- and oil-degrading bacteria and that there were subtle (sub-species level) changes in microbial distributions over time. We discovered that novel, low abundance microorganisms bloomed in the heavily altered deepwater and that the community adapted and changed rapidly as the geochemical regimes within the plume changed. We documented the highest rates of methane oxidation ever observed in the pelagic ocean and learned that methanotrophs, like most organisms, have limits: their activity is not infinitely scale-able and at some point, their activity declined despite plentiful substrate stocks. Now we are trying to figure out why that happened – why weren’t the methanotrophs able to just keep going and consume all the methane? I think we are close to an answer on that. We were also the first discover thick (>5cm) deposits of highly weathered sedimented oil near the wellhead and thinner layers of similar material extending a great distance from the discharge zone. At some sites, it was straightforward to fingerprint this material to the Macondo source; in other places the oil was very highly weathered and tough to fingerprint. Weathered oil sedimentation had significant impacts on benthic communities, including cold water corals and other sessile fauna who could not escape the ensuing “oily snow storm”. It will take these communities a long time, decades for the corals, to recover. Following the initial response, through funding provided by the GOMRI program, we continue to track the long-term impacts of weathered oil sedimentation on sediment microbial communities and their activity. We’re learning a lot about benthic fluxes and sediment re-suspension, which it turns out is important at depths (deepwater!) I would not have imagined. We have a better understanding of how microorganisms function as biological filters for hydrocarbons introduced to sediments and the water column at natural seeps. However, we’re only just beginning to understand the regulation of hydrocarbon degradation at natural seeps and the capacity of natural microbial communities to respond to and degrade acute hydrocarbon inputs. This work is important far beyond the Gulf: advancing the understanding of how environmental and biological factors regulate the capacity of natural microbial communities to degrade hydrocarbons is essential for predicting how these communities will respond to a DWH-like event in the future. What do you know now about this ecosystem, from on your Deepwater Horizon-based work? Any newly developed methods, scientific communication, etc. that you didn't know 5 years ago? Through collaborations with Mitch Sogin and Sharon Grim at the Marine Biological Laboratory, we are exploring microbial diversity using an incredibly sophisticated “bioinformatics microscope”. Most studies of microbial diversity use 97% similarity as a cut-off between “species” (and some microbiologists argue about even applying that “S” word to microorganisms). Using a recently developed method called oligotyping, we can probe microbial diversity to a much finer resolution and quantify differences at the 0.2% similarity threshold. Not surprisingly, there is a lot of ecologically significant, functional meaning within that 3% window. This technique is allowing us to document the ways through which distinct microbial taxa respond to particular environmental conditions. It’s incredible what this fine-tuned phylogenetic sleuthing is teaching us about hydrocarbon degrading microbial communities. We are working very hard to get a good set of ‘search images’ for the water column aerobic methanotrophs that inhabit natural seeps. This has been a big methodological challenge because most of the methanotrophs who increase in abundance when methane concentrations go up, are not ones we are familiar with. But, we are working on new techniques to reveal their identity. 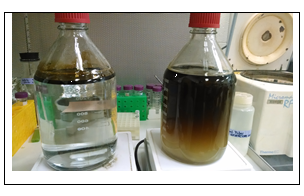 This is an example of an oil-water mixture (L) vs Corexit-oil-water (R). We use these in experiments to quantify oil degradation rates. We have worked hard to develop a standardized method for measuring rates of hydrocarbon degradation in waters and sediments. Previously we’d measured methane oxidation rates extensively, but components of oil are much more tricky. We have techniques for long chain alkanes and PAHs now and they are robust…it took a while but now we have environmental rates, which means we are starting to get a sense of what “baseline” rates of hydrocarbon degradation are. That is key information that was missing prior to the DWH incident. We have also developed methods for generating reproducible “water accommodated” and “water soluble” fractions of oil for use in lab experiments. Sounded easy but this took quite a while! In these experiments, we are examining the factors that modulate marine oil snow formation and documenting the impact of dispersants on microbial communities and on microbial hydrocarbon degradation rates. This is critical research – we need to know how dispersants impact microbial abundance and activity under environmentally realistic conditions in order to evaluate their potential use a response action to future oil spills. We have to document the factors that impact formation of marine oil snow as that dictates to a large degree the microbially-mediated transfer of oil from the water column to the seafloor. How's the Gulf doing in your opinion? Can you make any generalizations yet about whether/how this ecosystem is recovering? I don’t feel generalizations are appropriate and it’s hard to ‘rate’ how the Gulf is doing. It’s an immensely large and complex ecosystem and DWH impacts spanned from coastal marshes to the open ocean water column to the deep seafloor. The Gulf was a stressed ecosystem before the DWH spill – eutrophication, fishery pressure and stress, industrial pollution; all these things stressed the system beforehand. The DWH hydrocarbon injection represented yet another very complex, large-scale impact on the ecosystem. Some parts of the ecosystem (open water offshore?) have largely recovered; other parts (deep seabed, cold water corals?) have not. Much more work is required to quantify and understand the long-term impacts of this incident. It would be a lot easier to assess all potential impacts if we could close the oil budget but we can’t – we don’t know where all the oil and gas ended up, so it’s hard so say that we have a handle on all of their local and system-level impacts. How has being involved in DWH response and recovery work impacted you as a person and as a scientist? As a scientist, being involved in the DWH response taught me that we can do effective science in a “rapid response” manner. I was not so sure how this would turn out when things were starting. Usually I spend months planning a cruise and in the case of the DWH response cruises, we staged two cruises with a total of 8 days advance planning (basically 4 days for each of the first two cruises). I realized that having detailed system knowledge, as I and many of my ECOGIG colleagues did, for the Gulf, and for the Macondo area in particular, makes it possible to make pretty good decisions on the fly. System knowledge gave us confidence and that knowledge allowed us to trust our instincts and our instincts led to some incredible discoveries. Being in the DWH led me to push my boundaries and to push myself to do as much as possible for the greater good. The experience taught me to identify the things that are truly important and to invest myself fully in those things. I learned a lot about science communication and effective communication (effective being the key word there). Before the DWH, I was involved in science communication and education and public outreach but my involvement in the DWH response gave my voice a much farther reach. I felt a responsibility to share my findings with Federal responders and with the public, because the public was starved for knowledge. People wanted to understand what was happening to the Gulf system. I felt I could help them understand the situation and I explained what we were seeing in a manner that was firmly based on the data we had in hand. As it turned out in the end, the phenomena I spoke to the public about – namely, the discovery of deepwater hydrocarbon-rich plumes and presence of weathered oil on the seafloor – were deemed inarguable facts. The reality is that I would never have spoken out about these things if the data we had were anything less than rock-solid. But at the time, some people accused me (and others) of exaggerating the facts and/or inappropriately discussing data before they had undergone peer review. Then and now, I feel scientists are compelled to share what they know in a critical, honest, and transparent manner. We are obligated to explain to the public what we learn in the process of doing our science. In today’s world, it is not enough to be a scientist doing good science. Scientists must also be (or become) effective communicators of the science they do. The public needs to understand what we do, why we are doing it, and what we are learning. There is inherent value in the work we do and it is relevant to the public at large, not just to scientists. An educated and engaged public is the only way to change the status quo. My involvement in the DWH event has led me to become an outspoken advocate for the Oceans and for environmental literacy. My group has focused on the dynamics of nitrogen and carbon in the water column, both in the context of the DWH spill and in the broader context of oil and gas (petrocarbon) entering offshore waters from both natural and artificial sources. We have been able to document the movement of petrocarbon into the lower trophic levels of the planktonic food web, and have identified an unexpected linkage between the carbon and nitrogen cycles that’s apparently mediated by methanotrophic microorganisms that can also fix nitrogen. Over the last 5 years, we’ve learned a great deal about both the immediate and the longer-term impacts of petrocarbon release on offshore ecosystems, and we’re now actively exploring the mechanisms and organisms that are responsible for these impacts. How's the Gulf doing in your opinion? Can you make any generalizations yet about whether/how this ecosystem is recovering? What was your most surprising discovery? The plankton in offshore waters appear to have recovered from the impact of the DWH spill, which isn’t surprising given the dynamic nature of the water column and the rapid growth and short generation times of plankton. Our isotopic measurements have allowed us to constrain the movement of petrocarbon into and through the plankton over the years following the DWH spill. Our two most surprising and interesting findings have been that seeps have a measurable impact on phytoplankton biomass in the upper water column, and that injection of methane into the water column promotes nitrogen fixation at depth. What is your most significant contribution to advancing DWH science? The deep Gulf of Mexico has a rich community of organisms living on the seafloor. Our group studied the impact of the oil spill itself as well as the broad application of dispersant on corals. We found that in laboratory experiments dispersant and oil mixed with dispersant killed corals faster than oil alone at the tested concentrations. While these results held true for three different species of corals and thus are likely to be generally applicable, there was variation between individuals within species. These results indicate that mitigation strategies may also impact the ecosystem. What is the 'story' told by your research? Our ECOGIG research showed that cold water corals at some sites in the deep Gulf of Mexico were exposed to oil and dispersant as a result of the DWH oil spill. In our lab experiments we found that dispersed oil and dispersant can be toxic to corals and that corals react at a molecular level to these chemical even before they show outwards signs of stress. What do you know now about this ecosystem, based on your Deepwater Horizon-based work? Any newly developed methods, scientific communication, etc. that you didn't know 5 years ago? Before the DWH incident we focused on understanding how populations of corals are connected via their water-borne larvae. Because of the DWH we began work on the stress response of corals using a wide array of cutting edge molecular tools. Next to nothing was known about the impact of oil spills on deep water corals and over the past five years we learned a huge amount about the way corals react to oil, dispersed oil and dispersant. For example, corals appear to basically shut down their cellular machinery with the exception of a few stress response genes when they are exposed to chemical stressors. That surprised us because in response to temperature stress many genes are unregulated, not just a few. Some of the corals in our experiments did better in low concentrations of oil than in water -- making us think that they may have bacterial symbionts that help the corals process the oil. We are following up on that observation right now. Our most important finding is that dynamics at scales of 1 km (and likely also below) are far more important than expected in the transport and mixing of material in the Gulf; physics at these small scales were very important during the DWH discharge and played a big role in driving hydrocarbon distributions. This is true not only at the surface, but also at depth along continental margins. The importance of these small-scale dynamics is huge in relation to the DWH discharge because the physics allowed the oil to remain confined in very coherent structures with a somewhat limited horizontal and vertical extension (the deepwater plumes). Another important piece of the story is that the mean (time averaged) circulation in the Northern Gulf has little to do with the instantaneous circulation. Also specific to the Gulf basin-scale circulation is the issue of its peculiar seasonality. The Gulf’s physical dynamics are influenced highly by the Mississippi River discharge, and the discharge is incredibly variable. In 'normal' years, discharge is more abundant in late spring and this strongly regulates the depth of the mixed layer in June-July. But in flood or drought years, circulation and stratification can look very different. In other words, the system, while 'looking' simple (you have the Loop Current and the Eddys, and yes, it is not easy to predict when they detach but they are large, and easy to observe with satellites), is indeed far more complex and interesting. And river discharge does not only impact the ecosystem biology, but also its physics. In the coming years, it is very important to link the horizontal transport and mixing to the vertical transport and mixing. We could learn a lot about the Gulf that could potentially translate to other regions as well. What do you know now about this ecosystem, based on your DWH-based work, newly developed methods, scientific communication, etc. that you didn't know 5 years ago? Well, I'm not an ecosystem person necessarily, but the importance of small, km to sub-km, scale dynamics on the ecosystem is clearly something we appreciate much more now than we did in 2010. Patchiness is the norm in the Gulf. Spatial and temporal variability are very large, likely larger than we ever imagined possible. Our most significant contribution has been to verify that oil sedimentation was an important mechanism for oil removal from the Gulf’s water column and to quantify or put on number on the importance of this process, namely that 3 to 5% of the oil that was released went to the sea floor in a 24,000 k2 deep water area around the well. Of this area, only about 1/3 received oil input. We have highlighted that the deposited material could be transformed oil, either through chemical reaction or microbial activity, and thus have coined the term “petrocarbon.” When we say that there is petrocarbon on the seafloor, it does not mean that there is a layer of oil on the seafloor. It means there is organic material derived from oil. In addition we have defined the conditions under which oil sedimentation will happen. If an oil spill occurs near a river delta, oil will most likely settle to the sea floor. Our research is a story of where the hydrocarbons went. It was deposited on the seafloor, it went into the floating particulate organic carbon reservoir, it was assimilated into zooplankton, and there is some evidence that it might have entered the coastal food web. Oil sedimentation to sea floor is important an important process, but the long-term consequences of this process are still unknown. Microbial communities degraded the oil and in doing so, created conditions conducive to flocculation and, ultimately, sedimentation of oil to the seabed. Overall the Gulf of Mexico system appears fairly resilient. However, human activity is and continues to be a great stressor on the Gulf ecosystem. For example, in some cases, fish landings appear to increase after spill due to closures of fisheries during the spill. Thus overfishing can be more of a potential problem than an oil spill! In Louisiana coastal waters, the oyster beds were closed due to the oil in 2010. But now, five years later, this fishery is in better shape than the oyster fishery in Apalachicola, Florida where heavy harvesting was allowed prior to the oil coming ashore. The oil spill led to shifting environmental baselines. Shifting baselines means the slow overall ecosystem degradation had been occurring over human generations. The OIL SPILL added to this already significant problem. A large component of the ECOGIG-2 team is focused on the effects of oil and gas exposure on deep-sea corals. This group is led by Dr. Chuck Fisher, who has been working in the deep Gulf of Mexico for nearly 30 years. Shortly after the spill, he and I were called in to investigate the impacts of the DWH blowout on the deep benthos, from the deep-water coral reefs at 400-600 m depth to the area immediately surrounding the location of the Macondo well. We discovered the first impacted coral community a few short months after the spill. The corals stress response of releasing mucous and sloughing off tissue, along with the fact that they are stationary for their entire lives, allowed them to record the signal of the oil and dispersant exposure. Not the best result for them, but an outstanding “sentry species” for us. Dr. Fisher has been tracing the impact on this community by developing new imaging tools to re-locate and visually sample the same corals year after year. He has now put together one of the most comprehensive time-series data sets ever collected in the deep sea. This allowed us to identify similar impacts to other communities in the surrounding area, some up to 22 km away from the well-head and in 1900 m water depth. 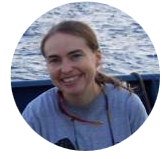 Dr. Cordes was mostly responsible for the identification of the corals in the deep sea, which is not an easy task considering some of the species we have found have still not been formally named and described. This has led to a greatly increased understanding of the coral diversity of the deep Gulf of Mexico and a greater appreciation for the role they play in the broader deep-sea ecosystem as a whole. In addition, Dr. Cordes and Dr. Iliana Baums have been conducting experiments on live corals to determine the relative toxicity of the oil and dispersant. They have discovered that at the same concentrations, the dispersant is actually more toxic to the corals than the oil. Their work is now turning to the genetic response of the corals to determine if specific genes or pathways are altered in response to these exposures, particularly at concentrations that are similar to those that they were exposed to during the spill. Ultimately, this may generate another tool that can be used to assess the impact in the event of future spills. There are multiple endings to the story of the fate of the corals in the deep Gulf of Mexico. Some of the heavily impacted sites continue to decline in health and will likely take hundreds of years to recover, if they recover at all. At some of the lightly impacted sites, some of the corals are beginning to regrow some of their branches and may eventually return to the state they were in prior to the spill, although this will also likely take decades to centuries. The loss of these corals has implications for the overall health and function of the deep-sea ecosystem. They host a community of other species that rely on them for shelter, feeding, and nursery grounds. Because things in the deep sea move so slowly, the effects of the loss of some of these coral sites will be felt for many years to come. One of the big “mysteries” in the aftermath of the Deepwater Horizon accident was the fate of the oil and gas that was discharged. As a consequence of the accident, we came to realize the inadequacies of our tools – we did not know the optical signature of weathered oil and our knowledge of vertical velocities and deep water circulation were not good enough to accurately predict the “deep plume”. We also did not know much about the “who, how many, how fast” of the microbial community that consumed the oil and gas – i.e. identity, concentrations, and metabolic rates of microbes. This lack of understanding led to false controversies as to where the deep plume was and what happened to the oil and gas at depth. I used the “ghosts of oil plumes past” approach to finding where the oil and gas disappeared – i.e. used signature of oxygen anomalies in the water column –studying layers of oxygen deficit caused by respiration by microbes that consumed the oil and gas. My primary tool were robotic devices (POGO and BOBO) that profiled the water column from the surface to depths of 1500m and measured temperature, salinity, chlorophyll fluorescence and backscattering due to particles in addition to oxygen concentrations. We used these measurements to show that the microbial respiration related to consumption of hydrocarbons persisted more than 300 km from wellhead and as long as 100 days after the wellhead was capped (Figure 1). One of the most surprising results of our research has been the discovery that oil seems to enhance phytoplankton concentrations. We came upon this finding quite accidently while working on techniques to distinguish between surface slicks of the cyanobacteria Trichodesmium and oil slicks from natural seeps in satellite imagery. We are still working out the exact mechanisms that lead to the enhancement of phytoplankton populations and determining the community composition of these phytoplankton. 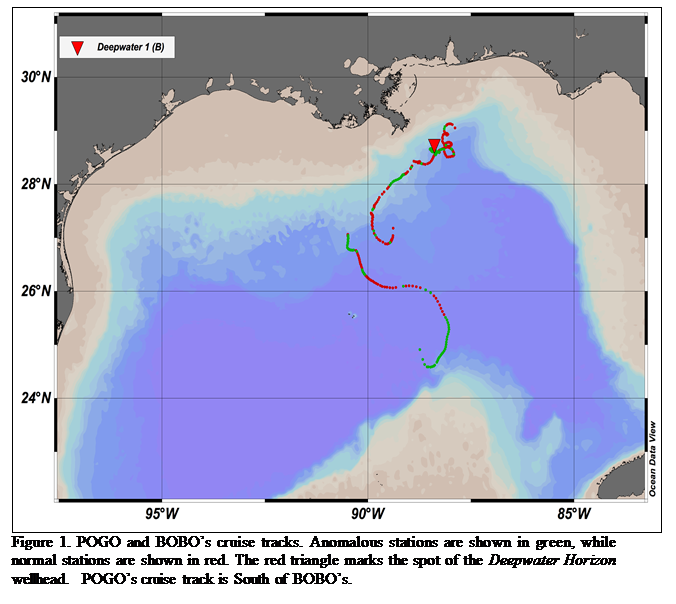 The major insight we have gained from our research is the notion that microbial communities in the Gulf of Mexico are preconditioned by the abundant natural seeps present in these waters to consume hydrocarbon present in the water column. Thus in hindsight, perhaps it should not be as surprising that some fraction of the oil and gas that was released by the Deepwater Horizon accident was consumed as rapidly as it was. But we still do not know the consequence of the explosion in the microbial populations – did the “law of infinite” dilution come to play in the water column and thus there are no long-term consequences or does even a temporary shift in the microbial food web have downstream effects that we don’t understand? These are questions that need to be addressed.